In the Hawthorne Country Store, we managed to obtain several Weird sodas along with our new Buff Orpington chick (for the full, thrilling story, see our review of Squamscot Grape). Today, we'll be trying the second of the bunch. Being geeks, we at the Lab are all extensively familiar with a certain very popular book series describing the adventures of a certain boy wizard in Britain (all of us except Nazgul, who has not yet read the sixth and seventh volumes in the series). We all enjoyed it, and I was especially happy when I discovered that the Wizarding world has its own peculiar Weird beverages. Several are described, but the one which the main character likes best is called "butterbeer". While it is never described in great detail, we do know that (1) it foams, (2) it is often served hot, (3) it is very popular with wizards and witches of all ages, and seems to serve a role analogous to sodas in Muggle America. "As the hot butterbeer trickled down over Gandalf's pale skin, Galadriel trembled with anticipation. 'I cannot deny that my heart has much desired this...' she whispered. Gandalf's staff rose..."
Oops. Er...that's not it. Wrong file. I'm sorry, that's an excerpt from Hot Caras Galadhon Knights, by Edmund Wells, the well-known Dutch author. Just a moment...here it is. "Harry and Hermione made their way to the back of the room, where there was a small, vacant table between the window and a handsome Christmas tree, which stood next to the fireplace. Ron came back five minutes later, carrying three foaming tankards of hot butterbeer. "'Merry Christmas!' he said happily, raising his tankard. "Harry drank deeply. It was the most delicious thing he'd ever tasted and seemed to heat every bit of him from the inside." Butterbeer makes several more appearances in the story. In fact, I think one could write a scholarly paper exploring conflict over butterbeer reserves and supply lines as a contributing factor to the rise of Voldemort and the outcome of the war. Acquisition of butterbeer can be seen underlying many crucial plot points and character decisions in the books. I note, for example, that Harry used his invisibility cloak to escape from his school, risking expulsion, for the purpose of getting that butterbeer*. Well, at the Hawthorne Country Store, they had "Butterscotch Beer", bottled by the Flying Cauldron. See? See the Wizarding conflicts sparked by the mere presence of butterbeer? Dueling, elf hunting, unbridled passions...it's more than I can bear. A slightly closer inspection shows that this actually comes from Reed's, who also bottle the Virgil's line of sodas and a series of ginger beers. Given the rather magnificent quality of their regular cream soda, I have high hopes for this. "Since 1374, the Flying Cauldron has been making this magical brew for under aged wizards or wizards who are young at heart at their brew pub in Hogsbreath England. The recipe has changed little over the centuries. It has the perfect combination of spells and quality natural ingredients. Add a scoop of vanilla ice cream to create our Giggle Potion." I can't imagine where they got these ideas! Ah, but that's OK...since the publication of the book series made the role of butterbeer in major Wizarding conflicts plain, there has been substantial effort among epicurean fans of the series to creating butterbeer. Actually, that's not the only thing people have taken from the books; Quidditch, the leading sport in the wizarding world (a sort of rugby/football game played on flying broomsticks), has been adapted for the Muggle world as well. There are teams, leagues, and everything. My older brother coaches a Quidditch team. No, I'm not kidding. Yes, there is clearly something wrong with my genetic line. In any case, I approve of Reed's having a go at replicating butterbeer. Perhaps they'd like to sponsor my brother's Quidditch team. Color: A nice dark amber, lighter than maple syrup. Scent: Moderately strong French vanilla scent, strongly tinged with butterscotch. Olorin: "Smells like buttery honey." Taste: Wow...very sweet. The vanilla cream soda is strong underneath it, with a very powerful taste of butterscotch on top. The butterscotch is much like that in butterscotch chips. Pleasant, if potent, and certainly interesting. K-i-C: *grimace* "Tastes like butterscotch. Which, I suppose, is appropriate. You know, adding vanilla ice cream to this would make it *less* sweet." The Kibbitzer seems to find this overwhelming. I guess I can see that, it's powerful stuff. I'm liking it pretty well, though, and the junior staff members are asking for more. K-i-C: "In fact, why is the sweet lasting so long? What's in this?" She looks. "Ahhh...stevia." She's right. This stuff is sweetened with cane sugar (quite a bit of it), with added vanilla and caramel, but then the bottler seemed to think that what it *really* needed was some extra sweet, so they threw in some Stevia. Because...why not? Plus, with the gluten-free aspect, I think it's now a health food. To be honest, I don't like it as much as their regular cream soda, but that's all right. It's still pretty good, and I have to give them extra points for going to the effort of making a strong reference to a good speculative fiction series. Plus, it's butterscotch, and that makes for a good Weird soda. Well done! Quaff rating: 3.5. Tasty, but not magnificent. Cough rating: 0.5. Probably too sweet. Was the Stevia really needed? Plus, just kind of overwhelming. *Well, that and seeing his friends, visiting Hogsmeade, and eavesdropping on conveniently-located conversations about critical plot information. But I think the Weird soda was his primary goal. **Yes, the Lab did once get together with some other families and have a cooking party in which we made recipes based on the book series, including an attempt at butterbeer. It was good. We are not ashamed. Really, there's only one way for someone like me to do a review of something called "Squamscot". Och, it was on the wild moors where I first saw Angus. 'Twas when the moon rose leprous o'er the heather that I first heerd the skirlin' o' his unspeakable pipes. The hideous pulsin o' the drone summoned visions o' vistas not meant to be seen by the likes o' man. E'en now, I shudder to think of it. Through the cobwebs o' mist, I caught a glimpse of his form. The silhouette was slumped an' slippery, like a half-melted haggis icicle. I heard his hideous, croaking voice lettin' words o' hideous import dribble into the air. And now we're gonna die." As he oozed into view, my mind tottered an' teetered on the very brink o'madness. That face...that voice...the squamous visage...N'gai'g'hroth...and God, O God...THAT BOTTLE O'DAMNATION IN THE HANDS O' THAT SQUAMOUS SCOT! This is one that I picked up from the Hawthorne Country Store, in Escondido. The Lab** felt that our two noisy chickens were not causing nearly enough destruction and devastation at our facility, and so we needed four more chicks to raise. Not only that, we needed very specific breeds...one of which is known as a Buff Orpington. I have to admit--when I hear the name "Buff Orpington", I envision a wealthy but irresponsible British rapscallion noble, who moonlights as an international secret agent and model for romance novel covers. In any case, our usual source for livestock didn't have Buff Orpingtons, so we called around a bit, and determined that the Hawthorne Country Store in Escondido had Buff Orpington chicks. When we got there, we discovered that they also had Weird soda. I was more than a bit surprised. But a Quaffmaster must always be ready to seize opportunities, and this was a good one. We picked up three bottles, one of which I will review for you tonight. "Experience the Past"? That sounds an awful lot like "The Shadow Out of Time", and THAT didn't end well for anybody. With a name like Squamscot, it really has to be New England-based. It comes from Conner Bottling Works in New Hampshire, so it seems legitimate. Or maybe that's just what They want us to think. In any case, it claims to be old-fashioned, and grape. That's good enough for me to try it. Where and when: purchased at the Hawthorne Country Store, Escondido, CA in January 2012. Color: A very dark purple. Scent: Fairly mild, grape-ish, dark and a bit herbal. Pleasant. Taste: Oh, that's nice. It's sweet--even quite sweet--but not cloying. The sweetener is cane sugar. Very clean. It's not actual grape, of course--it's almost exactly grape popsicle, which is a very good thing. K-i-C: "*pffuh* That's sweet. That's very, very sweet." K-i-C: "No...well, maybe grape Otter Pop..."
There is an aftertaste, but it's mild and pleasant. Just a hint of tartness. The main taste is dominated by a fairly pure sugar taste, with faint to moderate fruit tastes at the sides. It reminds me a little of Dublin Dr. Pepper. The K-i-C points out (correctly) that there is almost no tartness or tang in the main taste, which is interesting. It's a more pure taste than I usually get. The K-i-C doesn't care for it at all, and thinks it's too simple a sweet taste. K-i-C: "Even salt would be better. 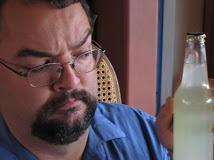 Maybe if you had a prosciutto soda to drink with it..."
So there we have it: an unusually simple, pure sugar with popsicle-y grape notes, and almost no tartness. I like it, but the K-i-C doesn't. But it's my Lab. MUA HA HA HA! Quaff rating: 4.0, if you ask me. Notably good. Cough rating: 0.5. Maybe too simple, but that's not all bad. *Not intended to be interpreted as a factual statement of true things which aren't lies. **To be more specific, one particular staff member. I won't say who, but her name rhymes with "Fribitzer-grin-Beef".